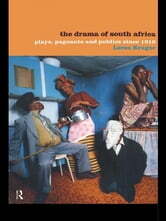 The Drama of South Africa comprehensively chronicles the development of dramatic writing and performance from 1910, when the country came into official existence, to the advent of post-apartheid. Eminent theatre historian Loren Kruger discusses well-known figures, as well as lesser-known performers and directors who have enriched the theatre of South Africa. She also highlights the contribution of women and other minorities, concluding with a discussion of the post-apartheid character of South Africa at the end of the twentieth century.